One thing that became apparent while developing the HBA/HEA Hoppers expansion was the length of life some of these wagons have seen, some still being in service up to the present day. Some of the HEA hoppers have managed to eke out an existence well into the 21st century as work is still found for a small number on the kinds of traffic they were originally designed for. 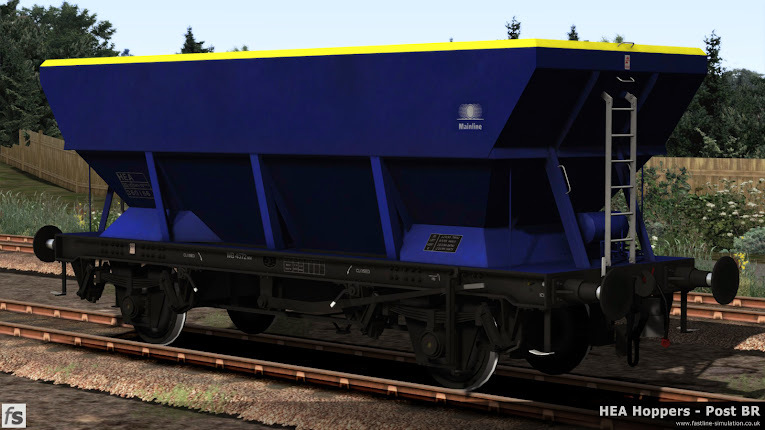 This expansion for Train Simulator 2014 will feature a variety of the later liveries carried by the wagons along with the care worn liveries of past eras still to be seen almost 30 years after they were first applied! More than a 'reskin pack' the models will feature physical changes that the hoppers have undergone in their 30 years of service with newly mapped and baked shapes alongside less obvious shape changes to allow neat application of new liveries, each with their own decal sets as appropriate. Naturally, there will be other little features added as we spot things that look like a 'good idea' and some scenario action to use them straight out of the installer.